Did you see our camping themed children’s bedroom last week? Our teammate Anna needed to update her little boy’s room and so we jumped in to help. The room was designed around the theme of camping and the great outdoors and we had fun bringing a ton of adventure into that little boy’s room! We were super excited to reveal the finished project last week and we’re even MORE excited to start sharing the DIY felt craft projects that made this room extra-awesome. Today we are sharing more from our felt crafts series. 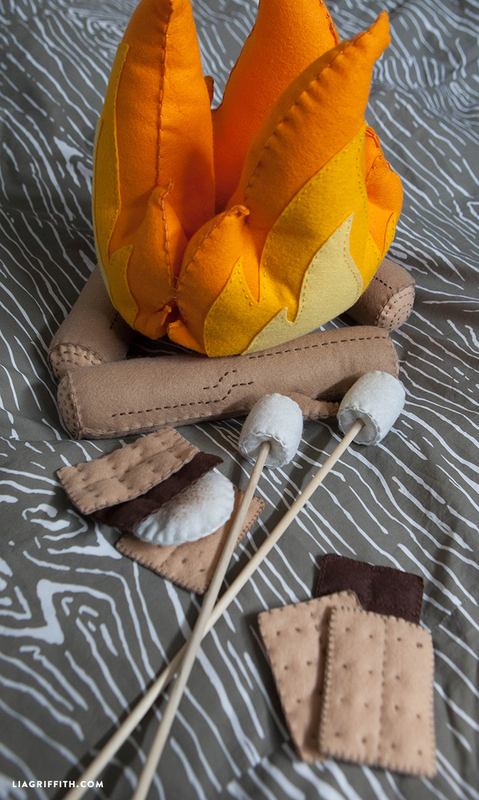 You may have noticed the fab felt camp fire (coming soon) in our kids camping room. 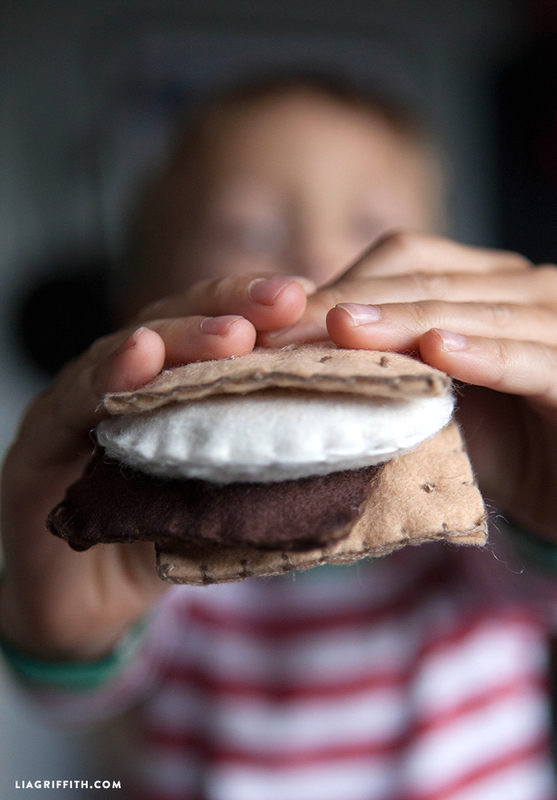 Well, every camper needs to cook up a delicious fireside treat and this felt s’more project is perfect for a little “child’s play” at home. 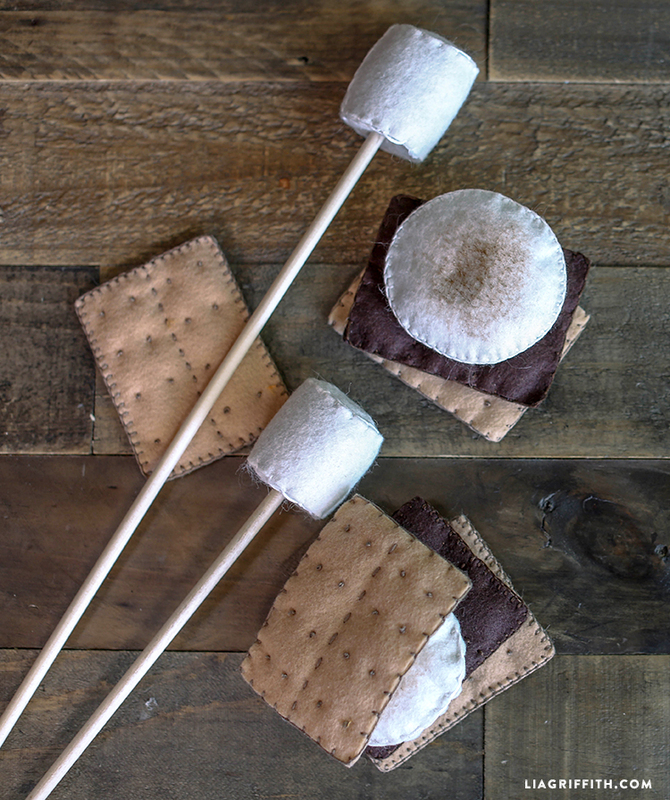 We are all for a realistic felt project and so our felt graham crackers are designed to look just like the real thing, our toasted marshmallows are slightly charred and our chocolate comes in perfect s’more-sized chunks. Our pre-toasted marshmallows have a little hole through which you can poke your toasting stick – seriously, could they be any cuter? Month. Tried to get on and can’t. Can you help. I think I’m only out 3 weeks..
Oh no! Can you send an email to hello@liagriffith.com and someone will look into your account. On the SVG file there are 2 long pieces. I’m thinking these are the sides of the marshmallows, but what size should they be? I tried pulling up the pdf file, but there was nothing on page one. Thanks for your help. Those aren’t supposed to be there– I’m sure glad you’re letting us know about the SVG errors! After a recent Design Space software update, it seems some of our projects from the last couple years need to be revised. This one has been fixed and re-uploaded. Thank you so much! I really appreciate your speedy response! I also appreciate the adorable and fun felt projects that you offer! Oh my gosh. This is the cutest thing ever! This is my first ever sewing project so forgive me if this is a ridiculous question but what kind of thread do you use for these? It just look thicker than the thread that I have in my sewing basket. Thanks for your help! We actually only did them on one side (way easier 🙂 ) We’re working on our own short video tutorials for stitches, but in the meantime if you google “french knot” you’ll find some really helpful videos. I am a crafting newbie and don’t know all the stitches. Are the circle stitches in the graham crackers French knots? If so did you make them on back and front? Also how did you get charcoal look on toasted marshmellow? Thanks for all the designs. I’m excited to make these for my kids. So cute! I’m loving your web site and being a member. Would like to see the campfire and marshmallow in svg files so I can use my circut. Would you happen to have these felt projects in svg files? We don’t supply the .SVG files for our felt projects because we cut everything by hand. I have not been successful cutting felt on the Cricut without some kind of backing applied first, which is not ideal for something that will be sewn after. So sorry about that! Oh my gosh!! I love it! Thank you for posting! 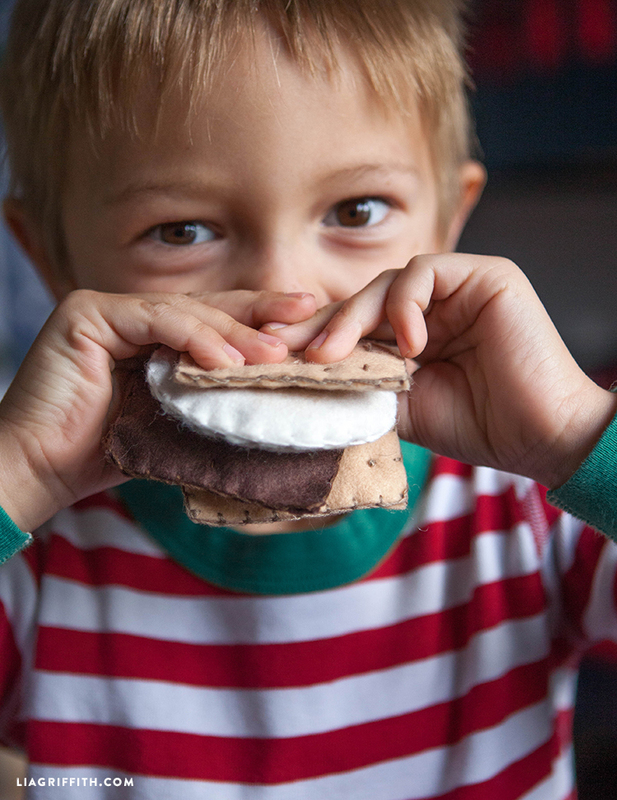 They can make s’mores without the sugar rush! You are so welcome, I am glad you like it!! So fun!! Questions, what size dowel and how did you do the perfect ‘toasted marshmallow’ coloring? Which colors of felt did you use? oh my gosh, this is such an adorable set!! Thanks so much for sharing the DIY, I bet this would make a wonderful gift set to make for a little one! Yes, and the felt campfire is up now too! Fun set.